On Sunday, December 15th, several Servant Brothers of the Home of the Mother received ministries in Cuenca from the hands of Bishop José María Yanguas. There were two ceremonies. The first was during the prayer of Laudes at 10:30 a.m., in which three brothers received the Rite of Admission: Brothers Kevin Deakin, Matthew Nobrega and Luke Amadeus Demasi. The Rite of Admission is the step towards priesthood where the universal Church officially recognizes the vocation of the candidate. In his sermon, Bishop José María Yanguas exhorted them to persevere in the path of the priesthood. These Servant Brothers have barely begun their journey and they still have a long way to run in their formation. 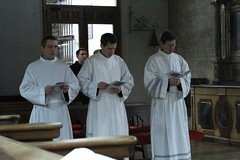 Those who aspire to be priests must care for four aspects of formation: the spiritual, intellectual, pastoral and human. 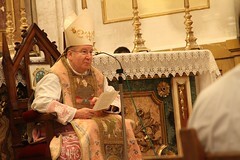 The Bishop stressed the human formation as base of the other aspects. Later he confirmed that in the Rite of Admission there are three wills present; that is to say, the desire of God that this candidate be priest, the Church that recognizes the will of God, and finally, the candidate himself who freely accepts the calling of God. 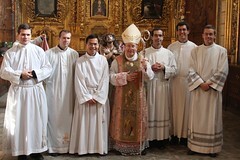 At midday, the second ceremony began, with a solemn Mass in the Cathedral where the brothers Carl Maes and Joseph Bloomer were instituted as Lectors, and the brothers Peter Dittus, Andrew Krische and Joseph Valle were instituted as Acolytes. The Lector is entrusted by the Church with the task of proclaiming the Word of God in the holy Mass, while the Acolyte has the task of serving on the altar during the liturgy of the Eucharist, of exposing the Eucharist and reserving it. In the homily, Bishop José María commented the Gospel about Saint John the Baptist. He encouraged the Lectors to meditate the Word of God, digest it and think about it to later proclaim it to the world. Then he directed himself to the Acolytes, advising them to care for the Eucharist, the center of the Christian life. Pray for these candidates to the priesthood so that they may persevere in the path that God has shown them.